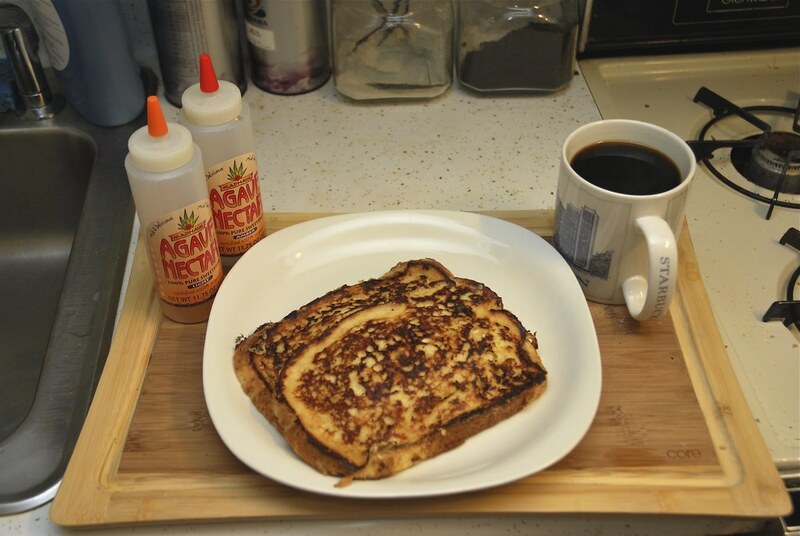 French toast is my choice of breakfast when I want to treat myself to something awesome. Something Amazing something great. 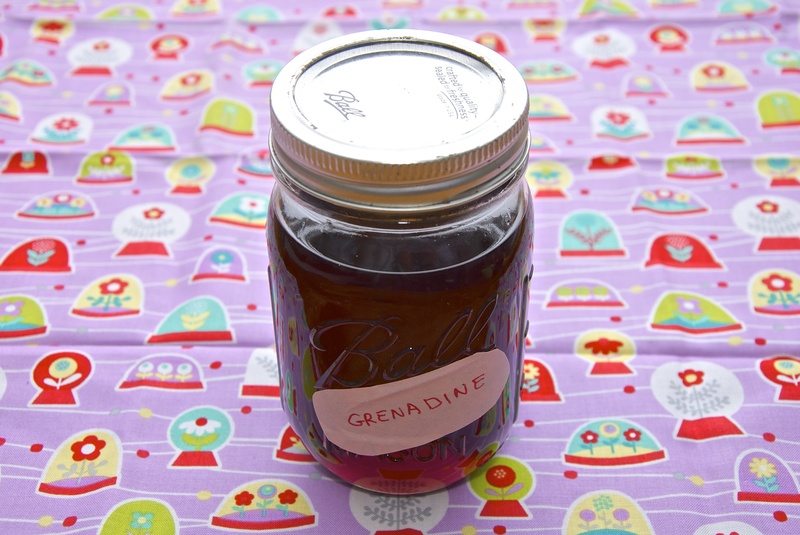 It is one of the quickest things to put together requiring only a few ingredients that you can find almost in every standard household. Usually made with stale bread, but now I don’t really wait fro bread to go stale. I just go for it. And so will you. Before we get to that though, we need to learn about its history. Origins etc. It is been a while that we felt with historic facts in this blog but, we are back to it. You missed it? 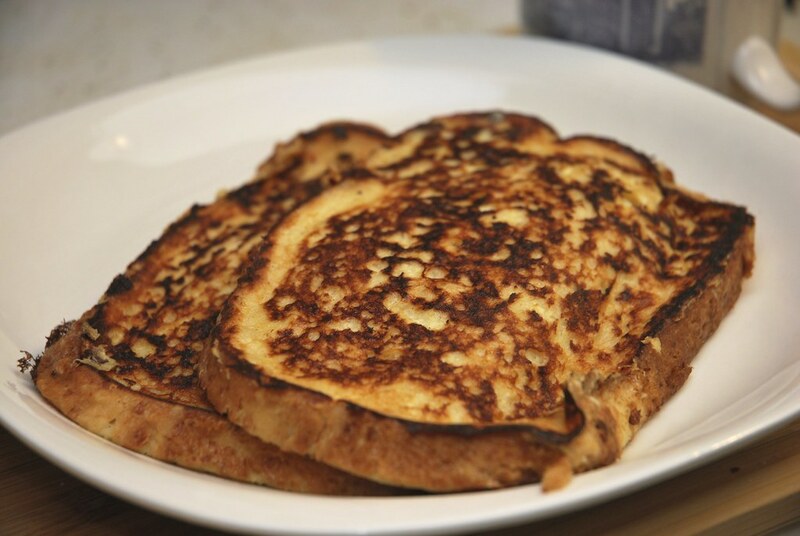 We call it French toast, but is it really? Yes. 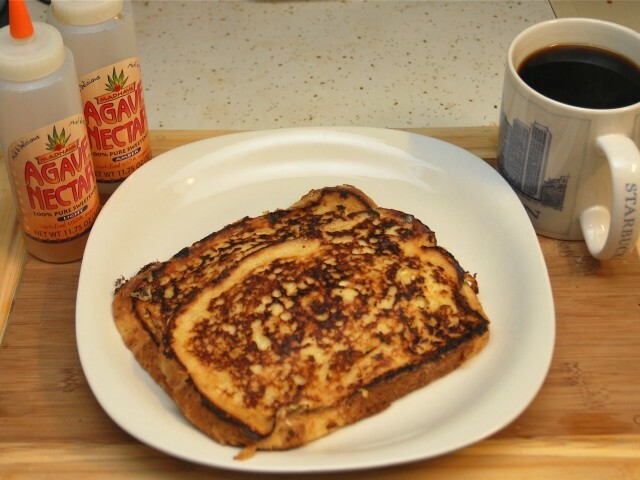 The french toast that we know is most likely french. But there are dozens of variations that put a mist of mystery around the name and its origins. One thing it is certain: it originate in Europe. 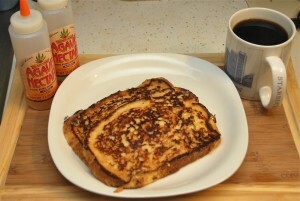 French toast is a way to utilize left over bread, that is hard and stale. Among all the continents, Europe is the one continent that embraced bread as the one and only fundamental food source. From Italy, France, Germany and Greece bread has been promoted to art. It is expected therefore to do something with stale bread. The idea is simple. 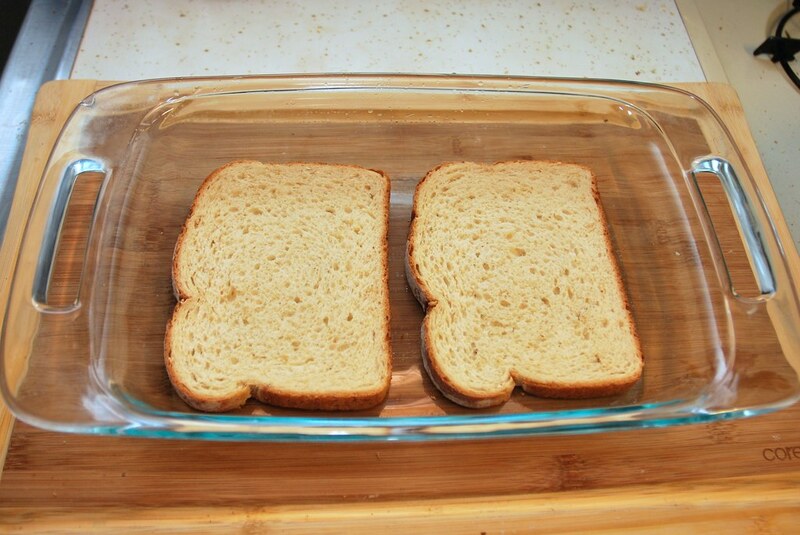 Use the bread that lost its lust as a supporting medium for other food items. Revive it and regenerate a structure or a texture that might not be the same but it can be equally fantastic. Among all the potential candidates the milk and eggs are the top choices. They were available to many households especially in the agriculture areas and were already the base for a large number of pies and deserts know as custards. 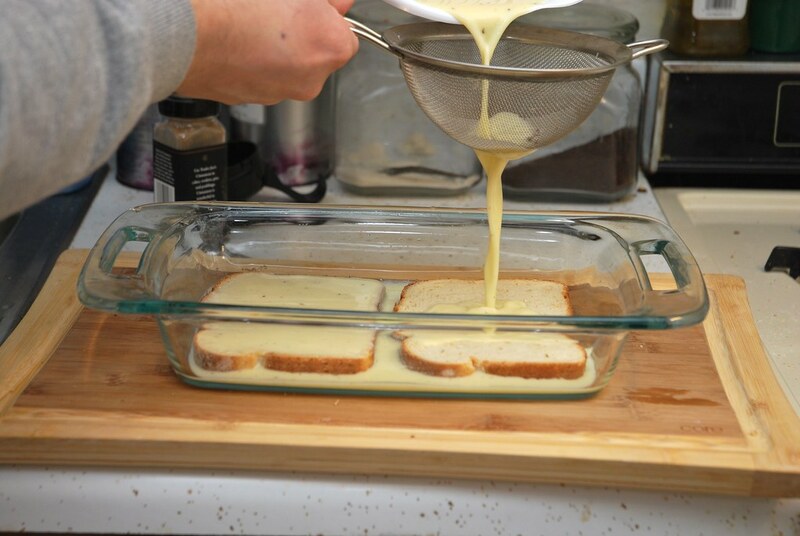 So it makes sense to soften the bread in a custard liquid and bake it again. Actually pan fry it. 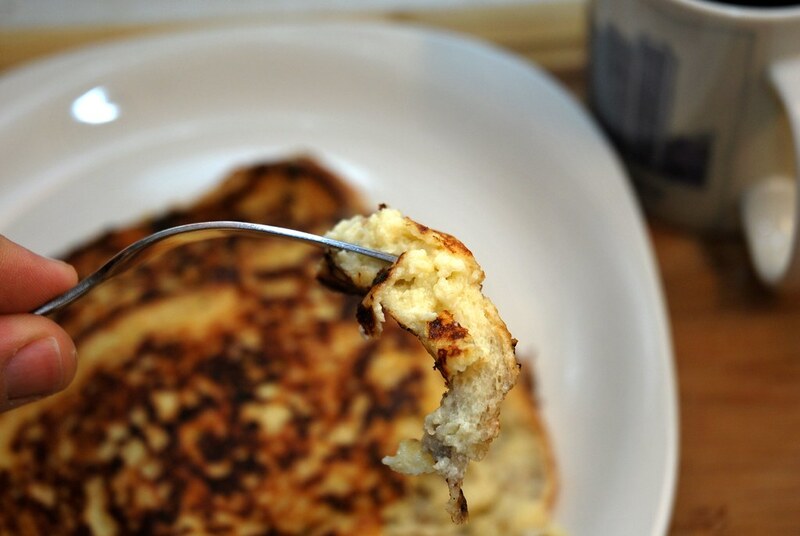 It will give it the custard rich taste and flavor and a nice crunchy crust to surround it. The question is however, how much of each and how? 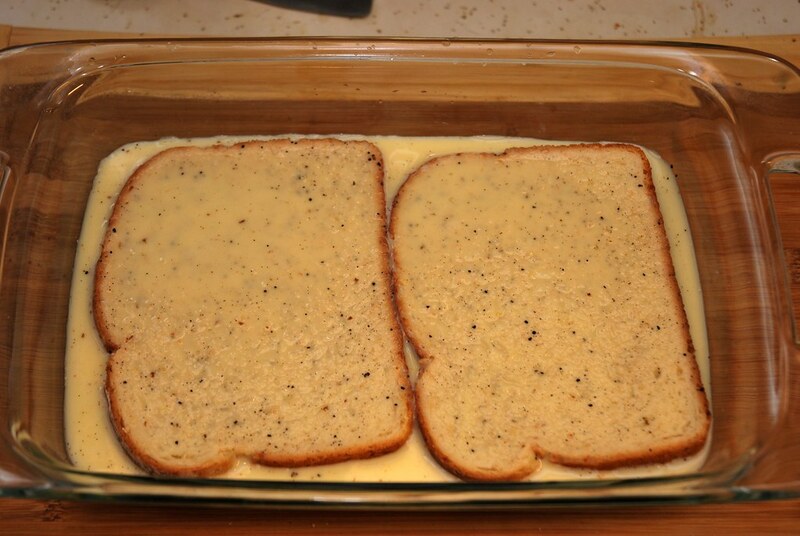 So finally I am pleased to announce that I cracked to code of the ultimate proportions for the custard that will make the perfect french toast. A slice of slightly stale bread. What bread? 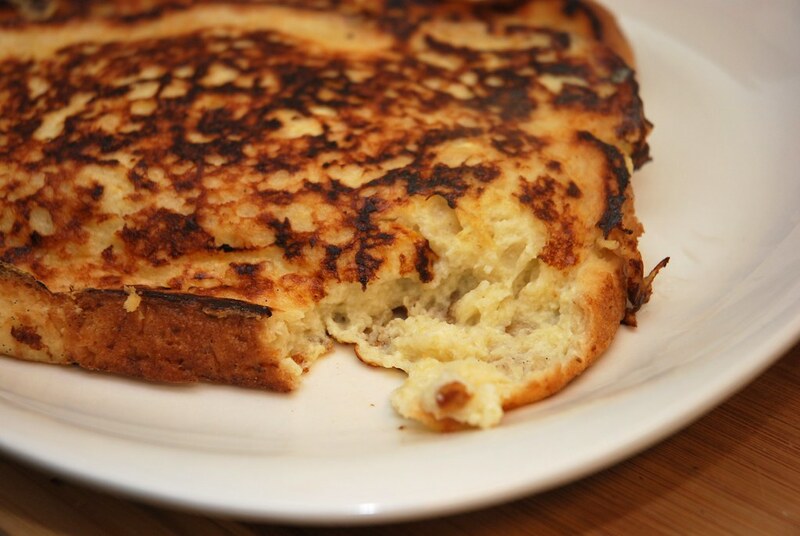 The rumor has it that challah bread that contains eggs is the best as it binds more to the custard mix. That is true, but… French toast is a way to utilize left over bread, buying bread just for french toast it defeats the purpose of making it. So I use what ever I have around. Usually Oatmeal bread. It is soft, absorbing and big! 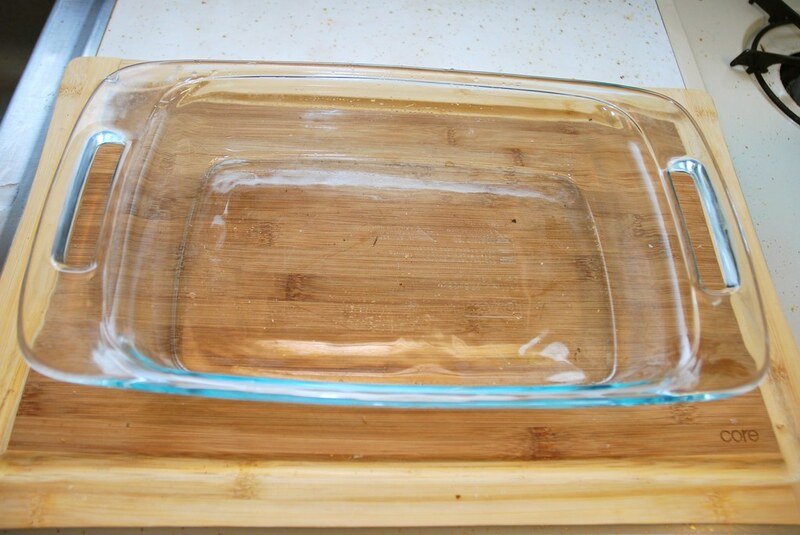 Just make sure that if there is a very thick crust, you remove it so it does not change the texture too much. The flavorings are up to you but I find Vanilla and cinnamon are the best things you can add. …and two eggs. 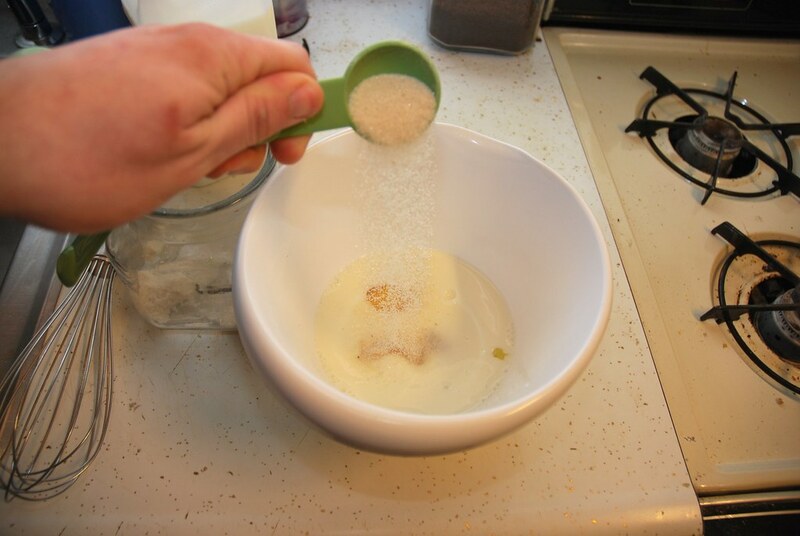 To be in the safe size I always add and extra egg and a 1/4 cup of milk. 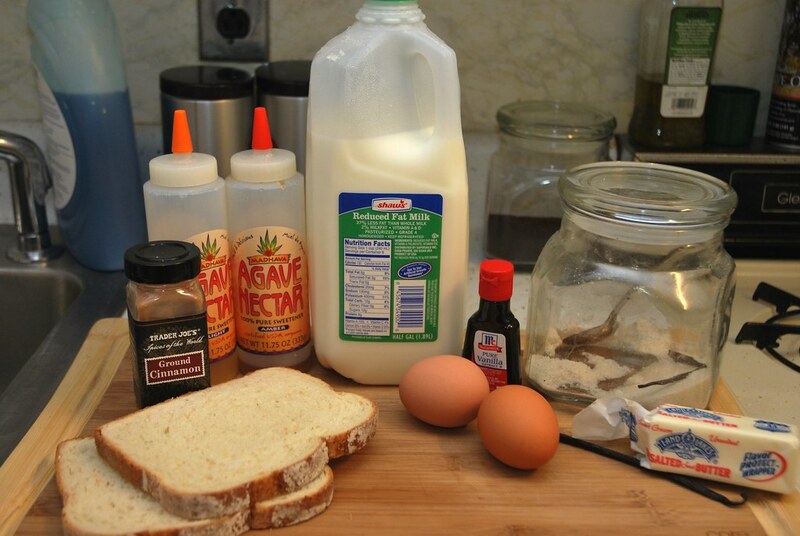 Follow that with the sugar according to the recipe and the number of toast that you are making. Add the vanilla extract. About 1/4 tsp. 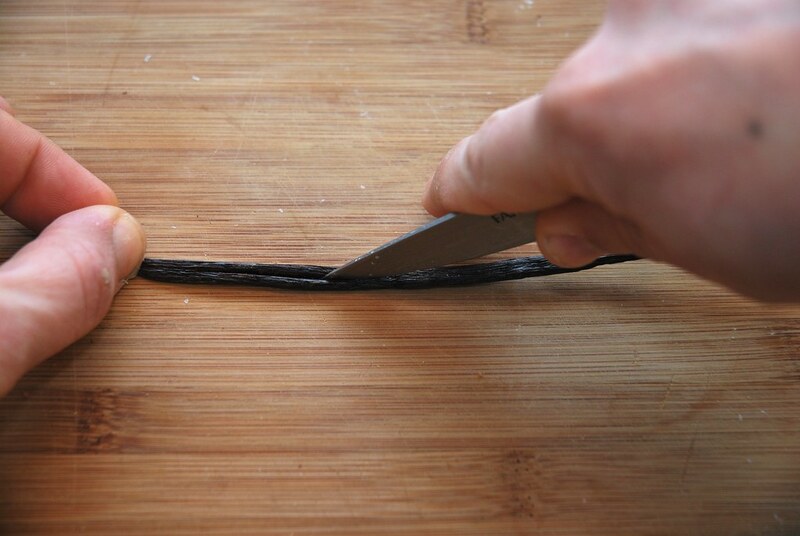 Take know the vanilla bean and split it with a sharp knife. Scrape the seeds with the tip of the knife from both sides of the pod. This is what we are after. The little tiny seeds of the vanilla. Chances are that you are going to scrape some fibers as well, but no worries we are straining everything. 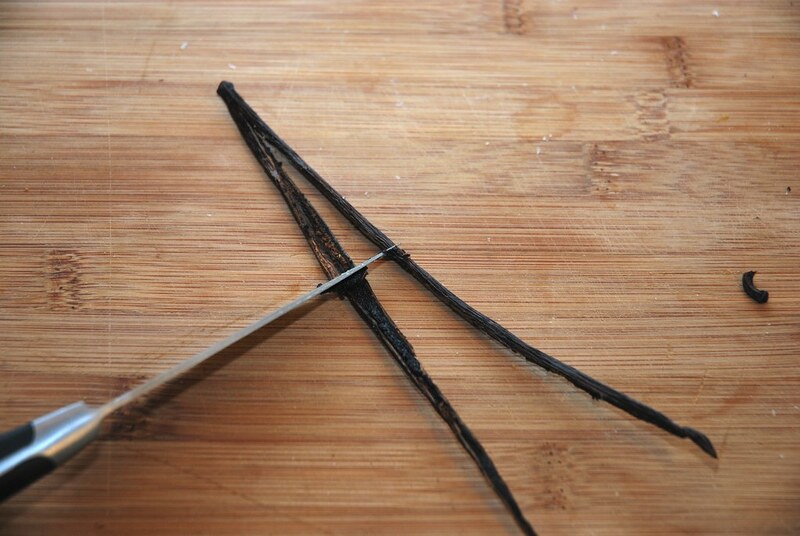 Now to answer the painstaking question: Why do we use both extract and Vanilla bean? Do we really need both? The answer is no… but… but… By using them both we get a combined effect. 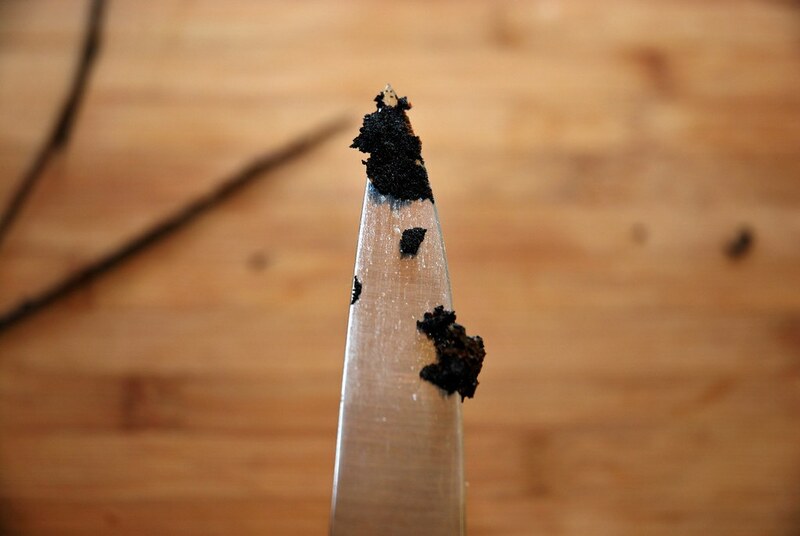 Vanilla extract is 40% alcohol and therefore it is very easy to transfer aromas to the nasal passages. 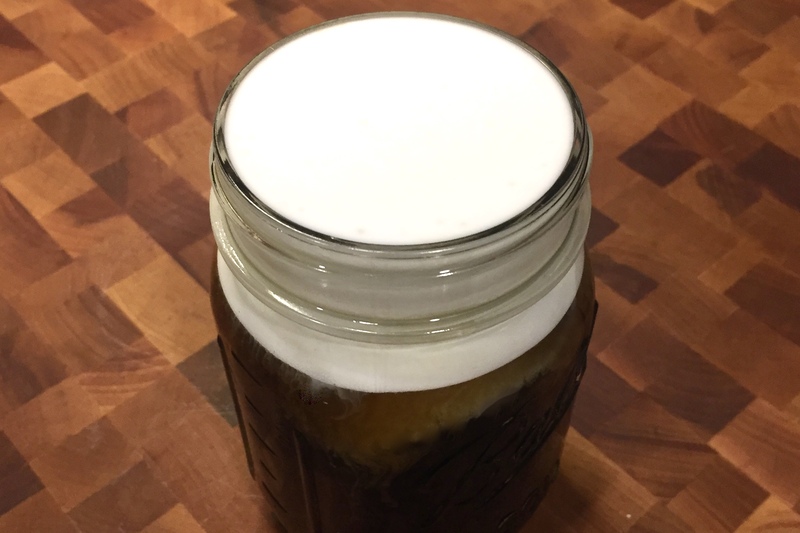 The alcohol although is a great solvent and preservative, it will eventually change the flavor profile of the bean. So by adding both we get the depth of the vanilla extract and the breadth of the bean. Also one thing I like about the bean is that the tiny seeds when squeezed between the teeth the explode with flavor just like fish raw. Now we can add the cinnamon in a pinch. It is strong and you don’t want to overpower the vanilla and the custard flavor. Just a pinch. Mix everything vigorously. 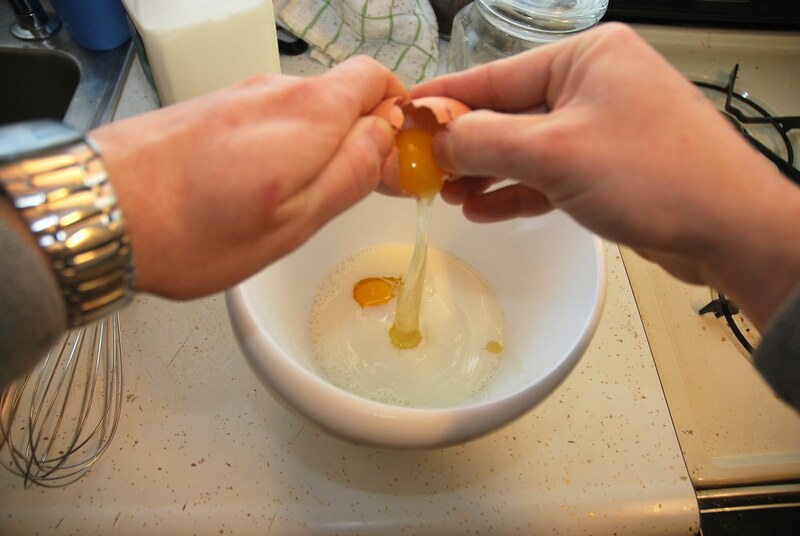 Egg whites are sometimes very strings tend to stay together and when you cook it there are white parts. Not very pretty. So mix well. Also all this so far you can do the day before. The overnight will make the flavors to get together better and release the entire aroma of the vanilla. Put in the stale bread. Stop! What is stale bread. It is a bread that has lost it elasticity and tears easy without deformation. Excuse the engineering lingo, but it is the best way to describe it. 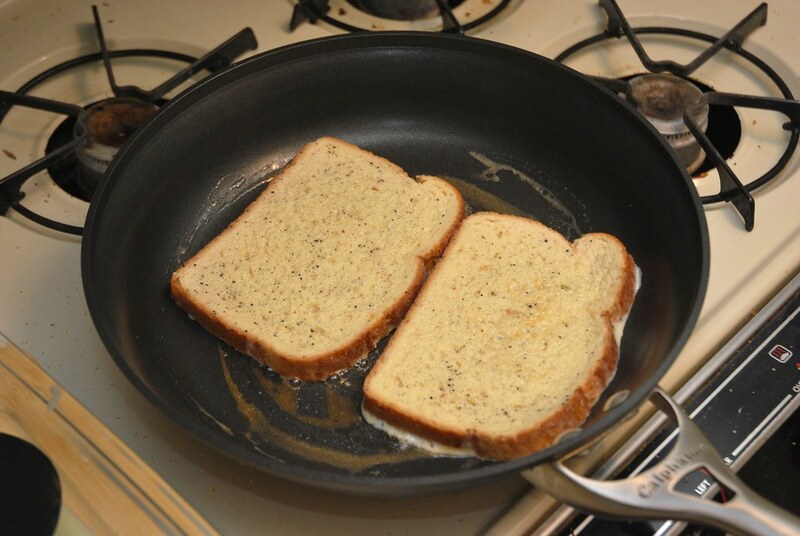 The idea of the stale bread is the higher absorbability that has as compared to the regular bread. How you get it? Well by letting bread to dry. That depends where you are. In Florida for example overnight was not enough. In Boston in the winter it is so dry that 10 mins are enough. Also keep in mind that most store bought bread is engineered not to go stale. I find that store bought bread is already absorbing enough, plus in the morning I am to hungry to wait fro stale bread. 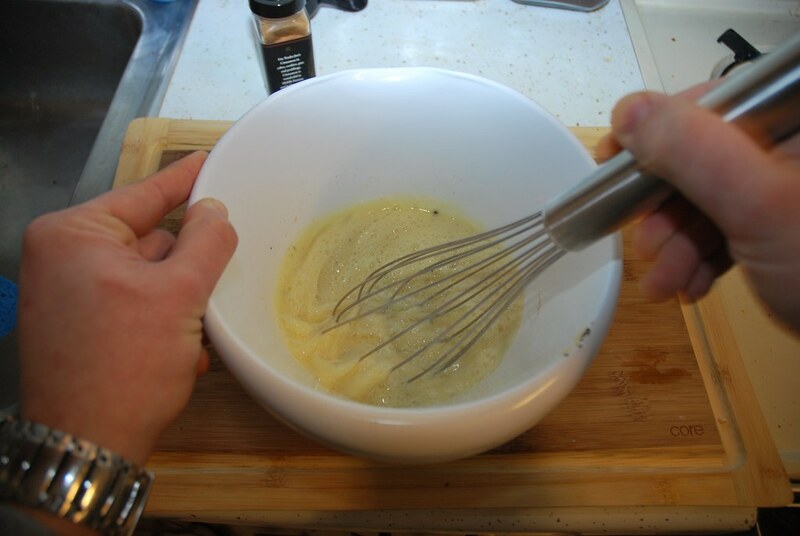 Add the mixture through a strainer making sure that you are adding the custard on both slices. Even if you are making more, I wouldn’t soak more than two in each batch. 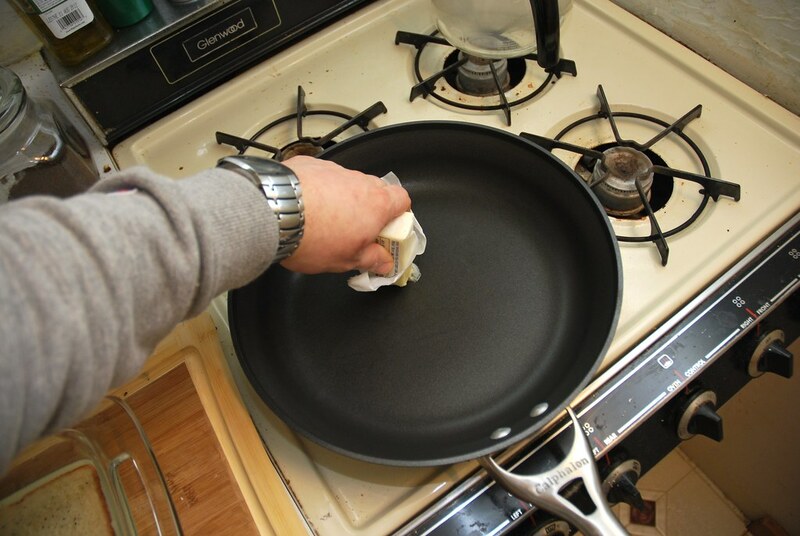 First of all unless you have a huge griddle you won’t be able to cook the at once. Also that makes sure you maintain the ratio between the custard mix and the bread. 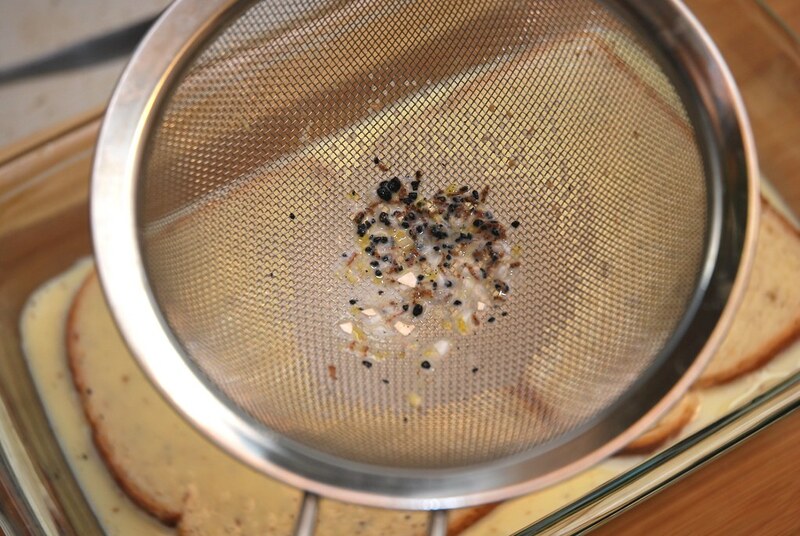 This is why you use the strainer. Mainly to catch the small pieces of undissolve vanilla, the chelae (the stringy part of the yolk) and in this case some egg shells. Let them to swim in there until they soaked as much as possible. 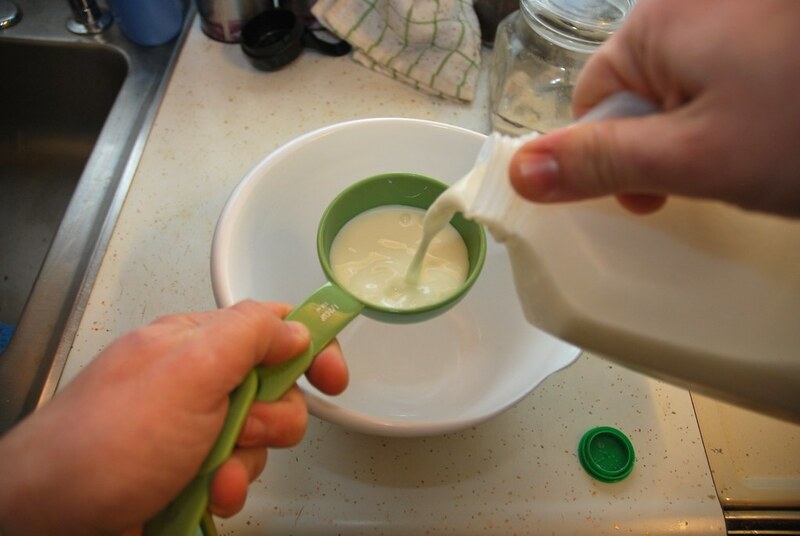 If you haves used the 1/2 cup of milk and the 2 eggs there will be no extra liquid left. It is, however, better to have more than less! While they are soaking placed the pan on medium heat and coat it with butter. Enough butter like this. 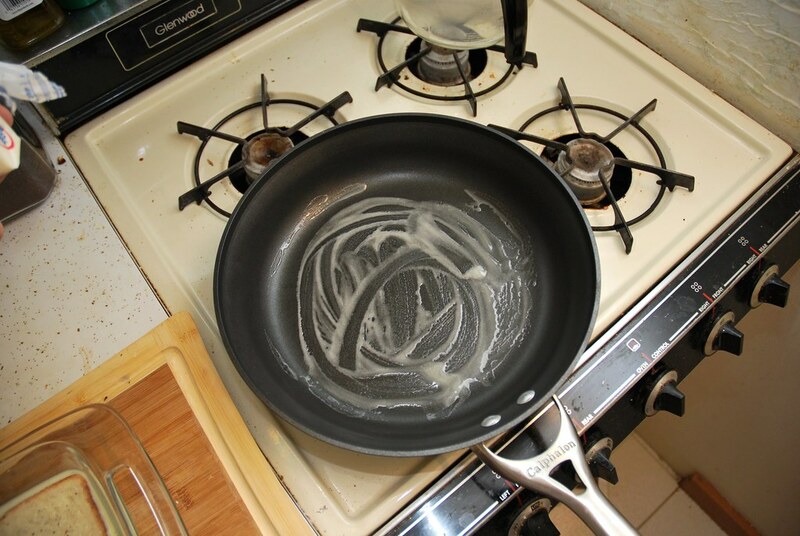 This is a nonstick and therefore even no butter would be ok, but butter is also a flavoring. 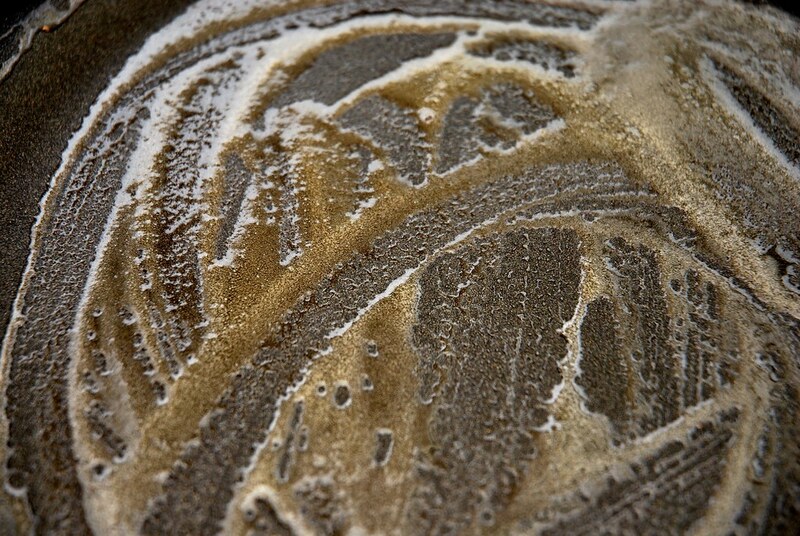 To get all the flavor of the butter let it on the medium heat until the solids separate: just like this. Wait till they start turning brown. Have a whiff… Oh Yeah! 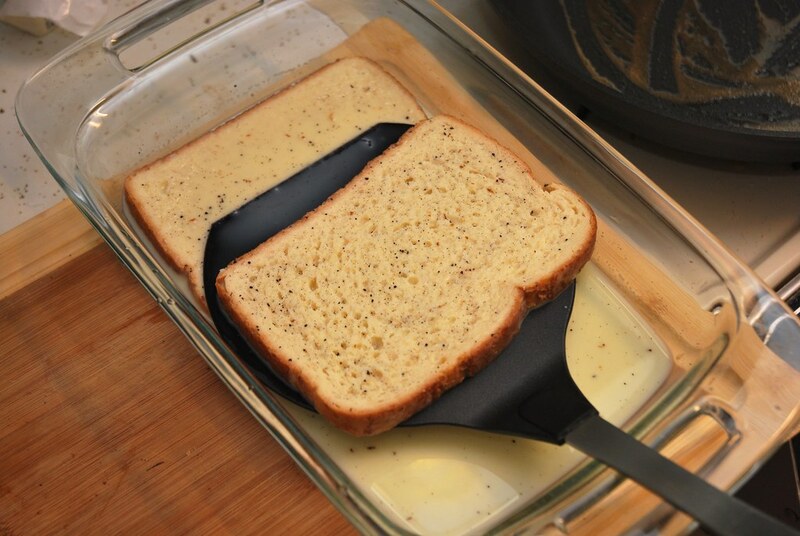 Use a large spatula to move the bread to the pan. 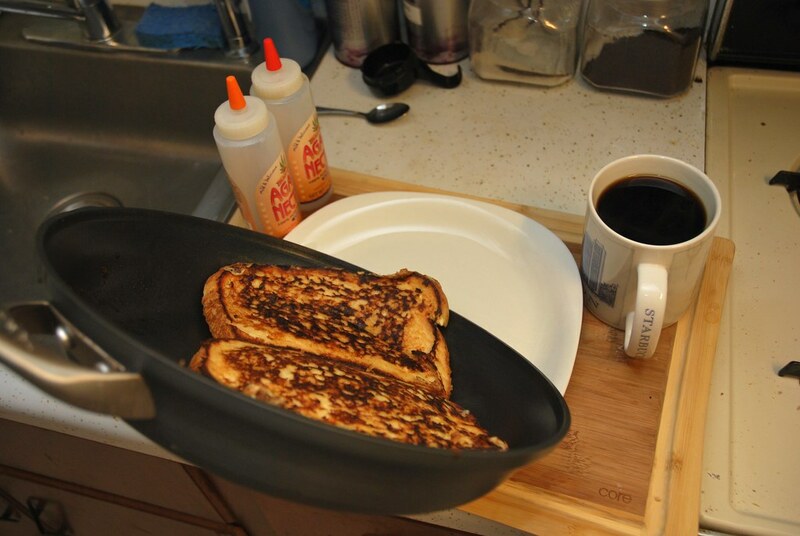 Here I am using one that I use for the pancakes. The bread can very easily tear so be very careful. 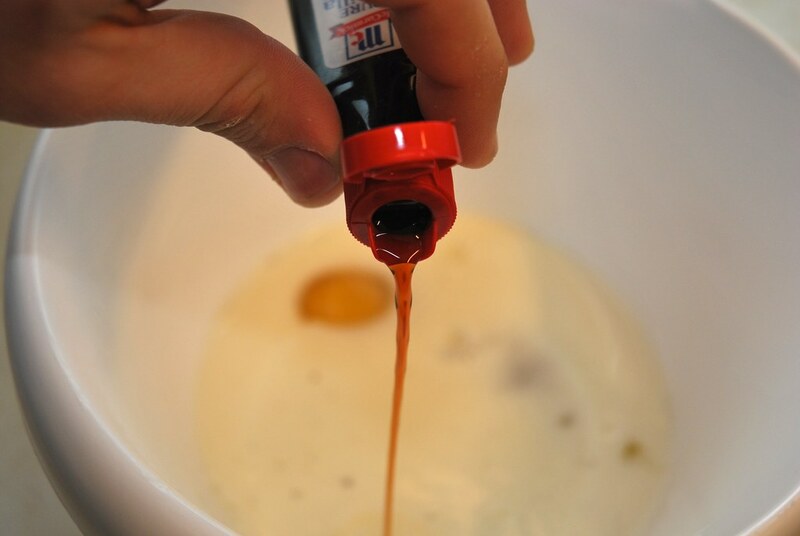 During the process you will squeeze some of the liquid goodness out, but don ’t worry. 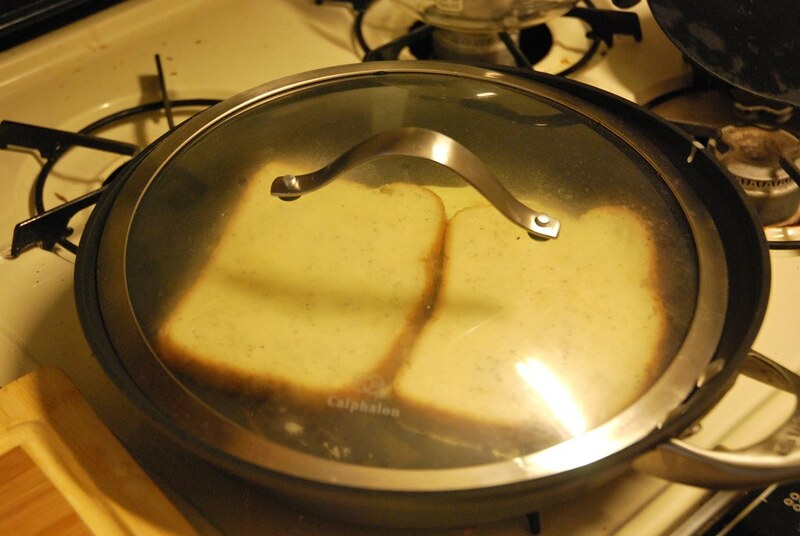 Place the bread on the pan. Have a look at this butter. Amazing! Turn the heat to the slowest setting. 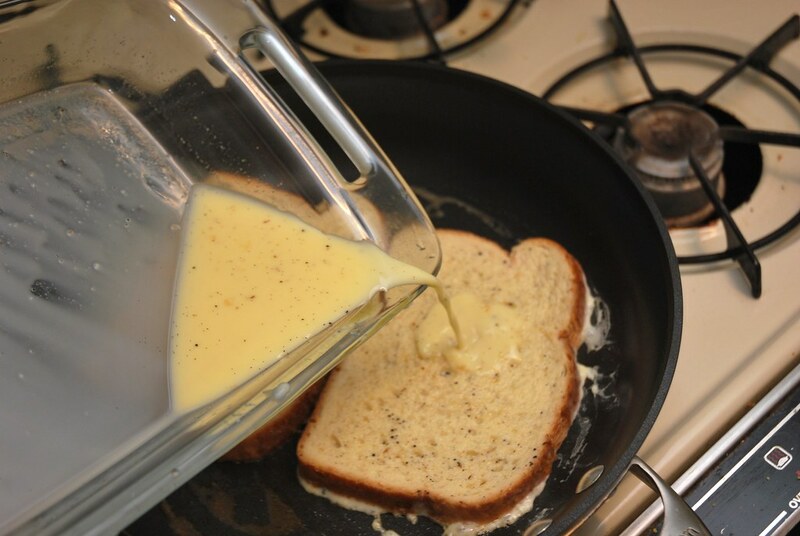 Now carefully split the left over custard among the bread. 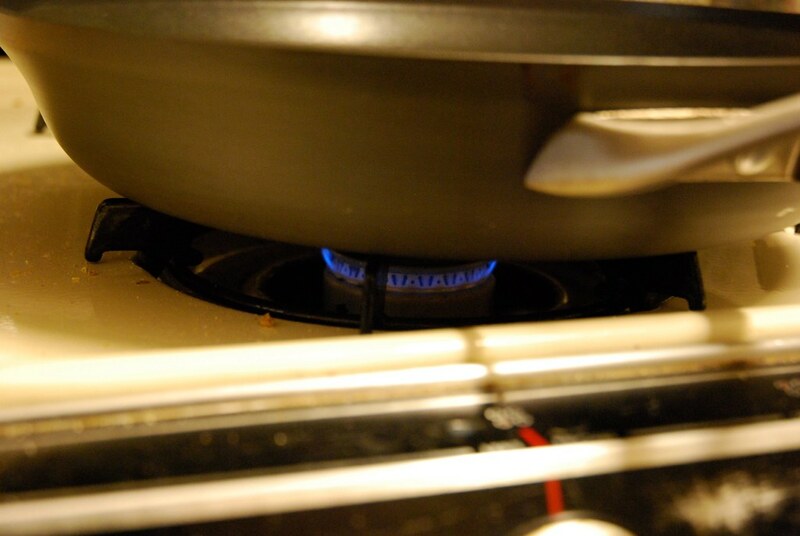 Maintain low heat for as long as it takes. 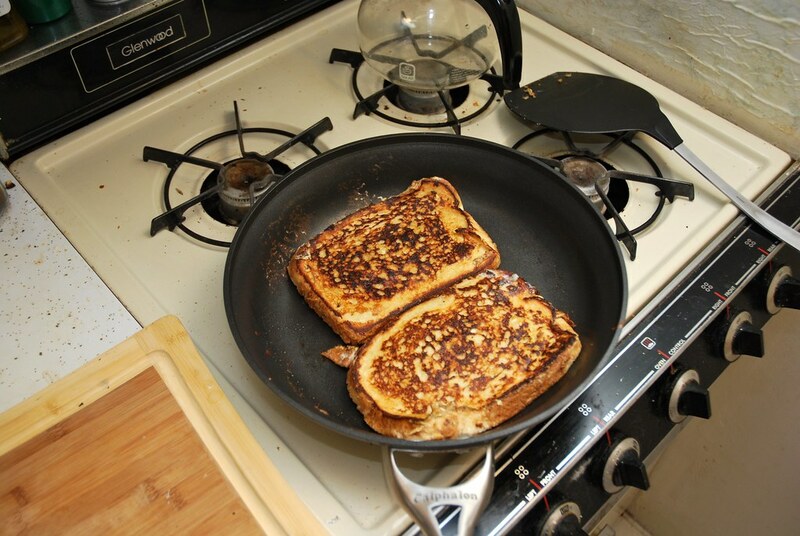 We need low heat, so we will cook the center of the french toast without burning the crust. 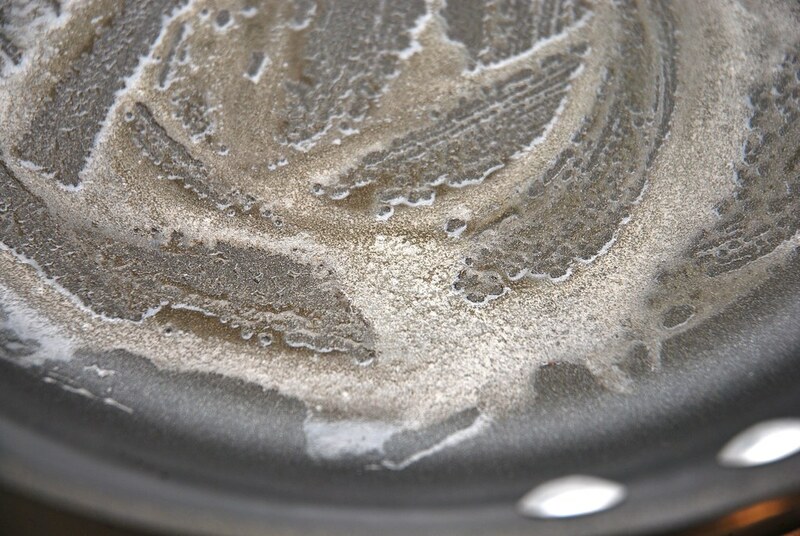 You might want to use a lid to keep the heat in the pan. When you get a nice color flip one. and flip two. Let it for a a while to get the same crust on the other side. If you done everything well, the toasts will puff! Once done placed them on the plate. 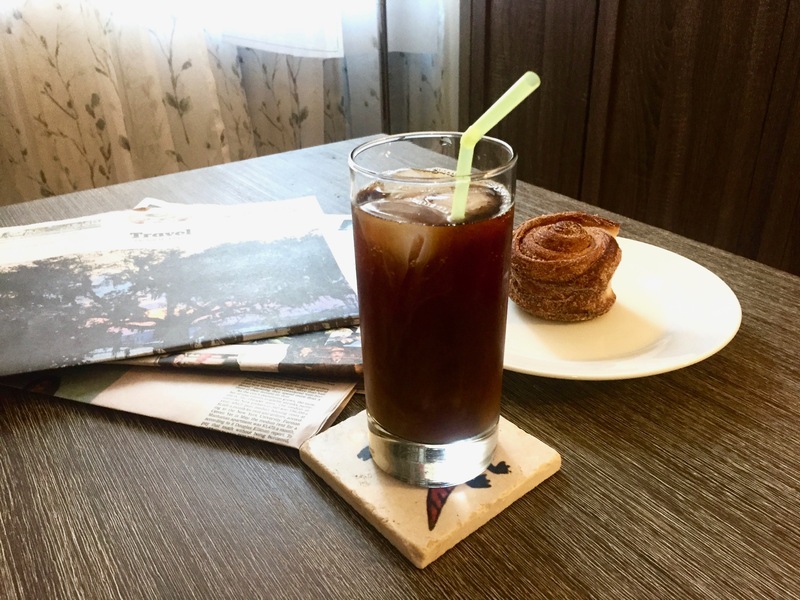 That by now has a coffee right next to it, a 3C Coffee is preferred and the traditional sweetener that it is in my house Agave Syrup. Here you go! This is it folks the best breakfast ever! Enjoy them warm! If you are planning more than two, that is the case most of the time, set the oven at 200 F and palce them in a rack to keep them warm and maintain the crunchy crust. Me? I eat them immediately. 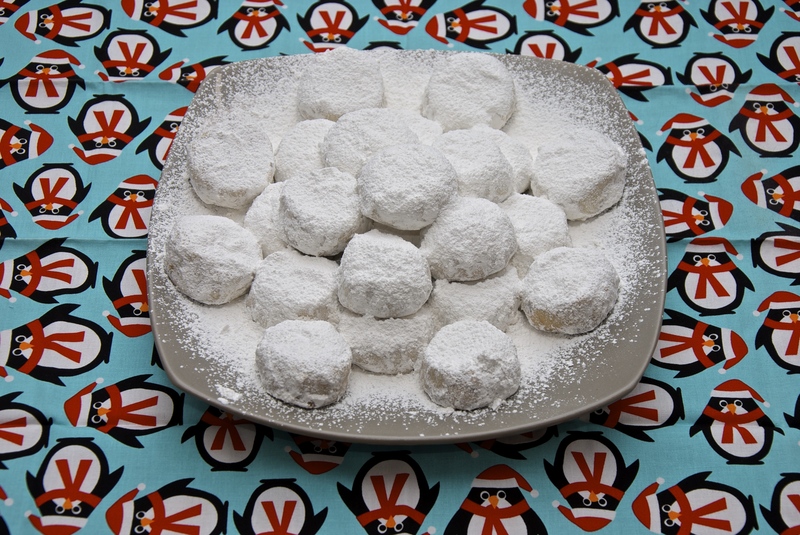 Some people like to dust some powder sugar on top, some berries, bananas, but this is not required. Just dive in. Look at how custardy and moist is the interior! Crusty and nutty outside, creamy and sweet inside! What better way to start your day! 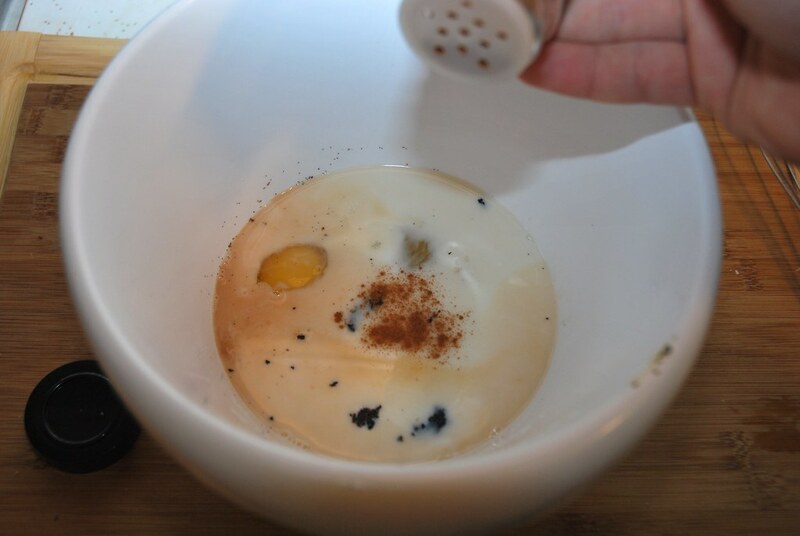 Beat together the milk, the egg, the sugar and the flavorings. 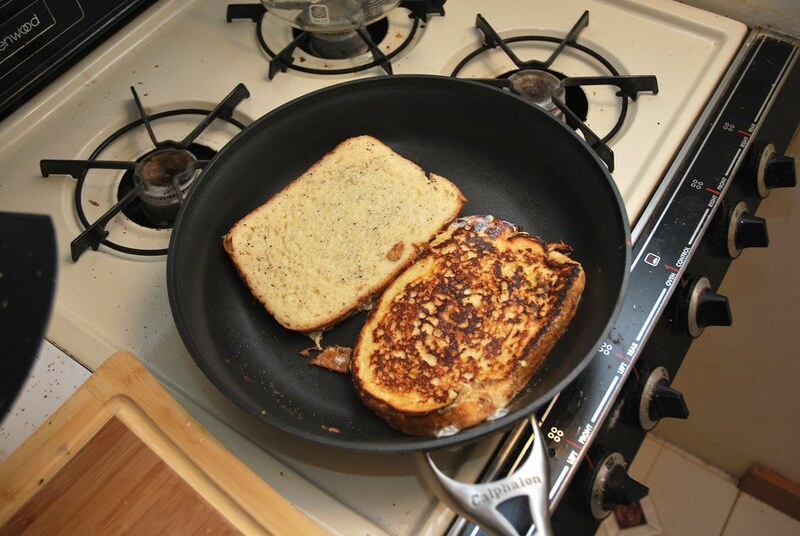 In a skillet melt the butter and cook the french toast until is crusty and gold. You can also make a savory version with salt and pepper and the addition of chives.